Gerald Durrell, who in this photo looks somewhat like a stout twinkly-eyed wizard, happened to be born in India. He was an English naturalist who believed that zoos should primarily act as reserves for endangered species of birds and animals. He founded a unique zoo to capture, collect and raise rare animals facing extinction, aiming to breed and perhaps eventually release them back into the wild. The wikipedia page of the Jersey Zoo, now called Durrell Wildlife Park, is worth a perusal. Summary: In this memoir-like book, Durrell has returned from a trip to Australia, only to find his zoo in shambles. 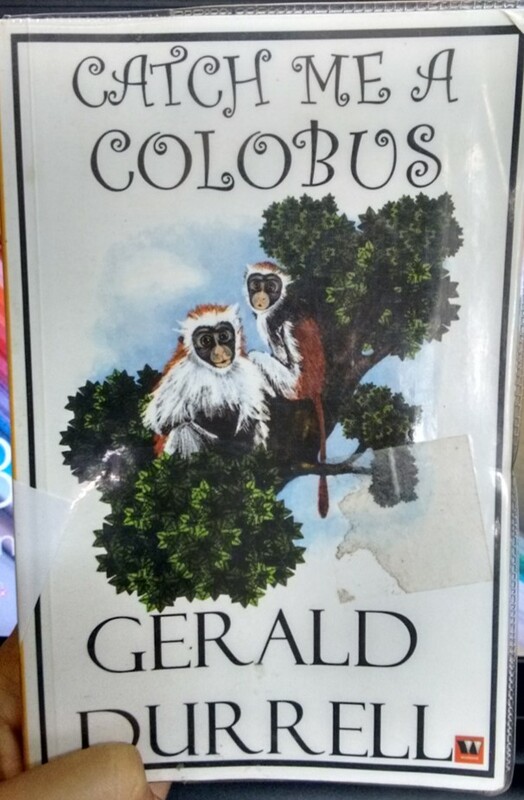 In Catch Me A Colobus, he recounts how they set up the Durrell Wildlife Conservation Trust, found sponsors and eventually built the zoo back into shape. The first half of the book is a compilation of vignettes expansing about seven years at Durrell's Jersey Zoo. From escaped chimps, pregnant tapirs and bullying parrots to stories of the strange characters that visit the zoo, like a woman who sat on a bird. Durrell and his staff care deeply for their animal cohabitants, which shows how his zoo is a long way off from the cruelty that is commonly seen in such places. The second half of the book follows Durrell's expedition to Sierra Leone to collect the rare Colobus monkeys and make the eponymous BBC series. The travelogues detail the conservation efforts or lack thereof across the world, the lives of tribals and forest officers, the customs problems Durrell faces when transporting animals across oceans and the difficult job of adapting the wild to a life of captivity. When Durrell speaks about conservation in the final chapters, he speaks with an admirable passion. When asked why I should concern myself so deeply, I reply that I think the reason is that I have been a very lucky man and throughout my life the world has given me the most enormous pleasure. People always look at you in a rather embarrassed sort of way when you talk like this, as though you had said something obscene, but I only wish that more people felt that they owed the world a debt and were prepared to do something about it." 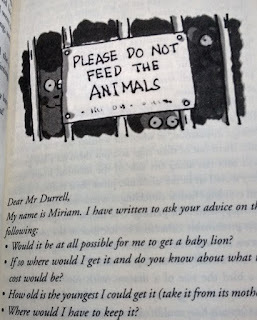 My thoughts: Durrell's dedication to his zoo is remarkable. In this pre-internet age, he conducts his research through a vast library of books on flora and fauna. He highlights the shortcomings of most books of science and explains how he combats them by maintaining intricate journals on the behaviour of the animals at his zoo. He also often reaches out to his contacts for assistance, from veterinarians and human surgeons to other zookeepers. Their readiness and the lengths they go to help out say a lot about Durrell himself. I had read a book in my mother tongue once about a similar conservationist's zoo, and I had a few issues with it. The main problem was, the writer kept attaching human qualities to the animals that made their behaviour a little misleading to the uninformed reader. The leopard threw a tantrum, he would say, and purred to me that he was upset with me. It was cute, but not quite scientific enough, and I kept wanting to remind him that it was a wild animal he was referring to. 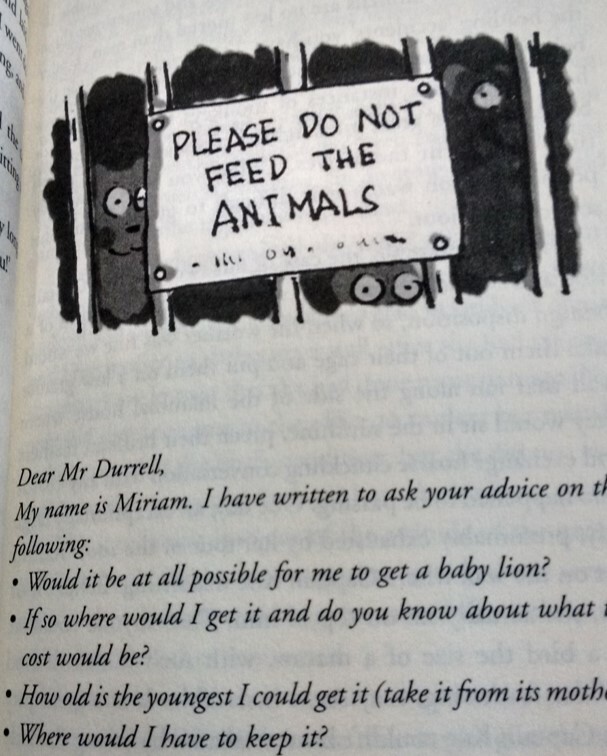 Durrell, on the other hand, displays his love for animals and their unique personalities quite well, while explicitly reminding the reader not to mistake a chimpanzee for a friendly little pet. Disappointingly, the book has no pictures, only cartooney illustrations at the beginning of each chapter. An annoying unnecessary addition are some rather absurd fan letters that beg the question - do people put in any thought before they put pen to paper? "Chris has heavy-lidded, green eyes, which he tends to hood like a hawk when he is thinking, and in moments of crisis retreats behind his nose like a camel. And there was Howard who was short and stocky with dark curly hair, and enormous horn-rimmed spectacles which made him look like a benevolent owl." Now, I would not have called an owl benevolent myself, but I can totally see it. It is silly and very entertaining, and only the tip of the giant iceberg that is Durrell's warm, endearing humour. The glimpses of his personal interactions with his wife Jacquie and his assistants make him out, perhaps self-flatteringly, to be a thoroughly lovable guy. Durrell is also pretty good at imagery. I mean, the man can really write. He sees the world with the eyes of an expert, notes even the tiniest of details, and yet, his conversational tone assures that we never feel overwhelmed by factual information. Check out these few passages on Durrell's first sighting of the Colobus monkey. I have never seen a tree or a monkey described with so much care and fascination. 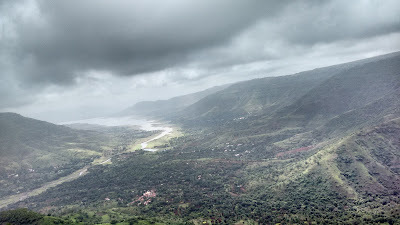 I was standing, looking out over the misty forest, when I heard some noises in the valley just below the house. I knew it was monkeys because there was that lovely sound as they leap into the leaves, like the crash of surf on a rocky shore. They were heading for a big and rather beautiful tree that grew a couple of hundred yards from the veranda just below us. It had a sort of greeny-grey trunk, the leaves were a very vivid green, and it was covered, at this time of year, with bright cerise-pink seed pods about six inches long. There was another crash and rustle amongst the leaves. And then, suddenly, it seemed as though the whole tree had burst into bloom, a bloom of monkeys. They were red and black Colobus, and they were the most breathtaking sight. They had rich, shining, chestnut-red and coal black fur, and in the morning sun, they gleamed as though they had been burnished; they were magnificent. When I looked back at the tree, they had all disappeared. 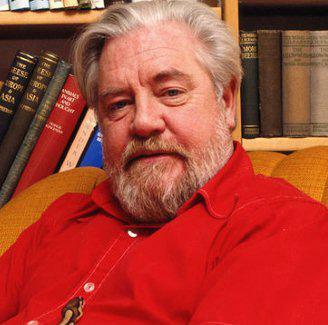 As I sat sipping my tea, I remembered a stupid woman I'd met at a cocktail party in Freetown, who'd said, 'I cannot understand why you're going up country, Mr Durrell. There's absolutely nothing to do or see there.' I wish she could have seen those Colobus. I cannot believe this is the first I have heard of this man. Catch Me A Colobus by Gerald Durrell is a treat for animal lovers, amateur naturalists, ornithology enthusiasts, and pretty much anyone with a liking for wordy English humour. This post is not about books. Let us call it an answer to, "What do you do other than read?" - an annoying question that is often popped my way. Last week I took a much needed day-out - a tiny road trip to a place called Mahabaleshwar, about a three hour drive from home, with many stops along the way. Mahabaleshwar is a hill station that attracts loud partying crowds through the weekends so we went on a Thursday, desperately hoping to have it all to ourselves. A good idea, it was quiet and soothing. I always have all sorts of fun with my mother no matter where we are but the rain made this day most special. Lately I have had a curious obsession with references of rain in books. And there aren't as many rainy good-times in literature as I expected. No kissing, dancing, playing scenes. It's all power, destruction or simple hassles. Disappointing, really. 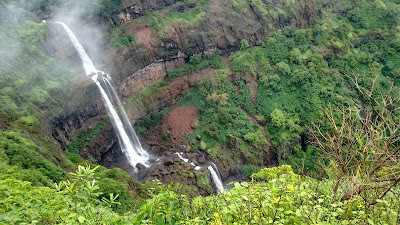 Last Thursday, it rained quite a bit and the whole time there we were walking through clouds. It was dreamy and very fairy tale. The mist made it nearly impossible to take pictures, but I tried. Rain is such a nature's prank. Half of my state has landslide-causing downpours right now even as the other half suffers a drought. And even in the most urban of places, we can only pretend to have it under control. Roads turn slippery, wind upturns umbrellas and puddles leap up to splash trousers, coolly impervious to fancy raincoats and gum boots. The child in me delights in watching a sudden shower make prim grown-ups lose composure, hopping over puddles, grabbing at each other, arms flailing for balance, a screaming bunch. A favourite childhood pretend-game was jumping around in muddy red puddles with friends, calling for help, a group of pixies who had fallen into cups of chai. Thank you, Enid Blyton! Of course, the romance of rain for me may simply find its roots in iconic Bollywood rain-dances (worth a watch for the fun of it if you have never seen any) but I think there is more to it than a six-year-old's choice of fandom. I read a quote somewhere about how rain alters everything it falls on. And it does wash away both literal grime and figurative - leaving us with that peculiar scent of churned mud and humid air, and trees that have cast off their ashy olives and jades for a lush shimmery hue, and if we just embrace the water splashing on us, a thoroughly relaxed mood. It also gives an excuse to stay in and watch this transformation, with a steaming cup of tea to fight off the cold, revelling in the comfort and guise of control. More power to you if you extend the comfort to that neighbourhood stray, there is no thank you like a vibrating purr. Another highlight of our day-trip were the seven temples we saw along the way, possibly more than I have visited in the entire year. My interest in religion is mainly mythological. Hindu mythology has all the charms of the Greek and about ten times its scope. We have all manner of gods - powerful, weak, blue, elephant-headed, anthropomorphic sun and moon deities, who all have multiple earthly incarnations, egos, clashes and feisty goddess-wives. They have many demons to fight and are accompanied by everyone from angels and saints to ginormous talking eagles, apes and bulls. The bull called Nandi is the vehicle of the great god Shankar or Shiva. He is one of my favourite creatures in mythology. He stands as gatekeeper outside every Shiva temple, but is deliberately poised facing the shrine. First disciple, then guard. In more intricately sculpted temples, you can see both Nandi's mellow, wise eyes and powerful musculature in the stone - a juxtaposition that really captures the spirit of a gentle but strong bull. Sadly, I can only find photos from one temple in which no one has photobombed my Nandi. At the main temple at Mahabaleshwar, I read the fascinating legend that gave the place its name - the story of a mighty demon named Mahabal who gave up his immortal life in exchange for the privilege of sharing his eternal resting place with his god. And the compromise made him godly too, it seems. They had even put up an English version of the story. I could post it, but the translation is clumsy at best. The temple is some five hundred years old, while the idol inside claims a life of perhaps more than a thousand years. Road trip, however small, means awesome street food. As someone whose vacation at home is on the brink of its end, I jumped at this chance to gorge on everything homey I could find. I give you, a collage of some of our colourful choices - onion fritters, strawberry with cream which is a Mahabaleshwar-speciality, a spicy curry with bread called misal and that steaming cup of tea that we know adds an extra flavour to rain. Phew, that's quite a long post for someone apparently only used to writing about books. I hope to branch out more often on Tabula Rasa, rather than trying to keep two blogs. 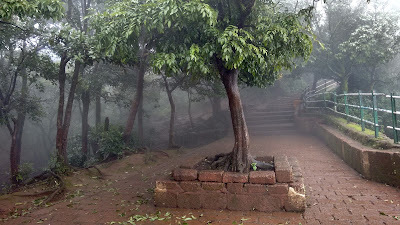 Meanwhile, I would love to read your thoughts on rain, food, mythology and such days-out! The film begins so - "The breakthrough in medical science came in 1952. Doctors could now cure the previously incurable. By 1967, life expectancy passed 100 years." Never Let Me Go is set in this alternate reality. It follows the lives of three children, Kathy, Ruth and Tommy who grow up together in a typical English boarding school. Except, Hailsham is not an ordinary school. The children are "duplicates" or clones whose lives have a special purpose - to make organ donations, a fate clear to the viewer from the start, but not to them. 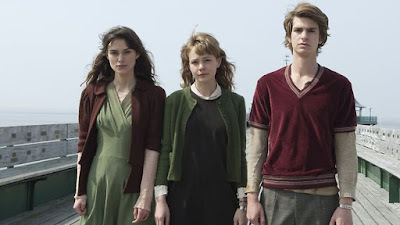 A coming-of-age journey like no other, Never Let Me Go is a search for identity, hope, a tale of friendship and unrequited love, as Kathy, Ruth and Tommy grow up to face what the world has in store for them. Two years ago, I wrote a rant-review of Never Let Me Go by Kazuo Ishiguro, the book (read more about the plot there.) The movie, directed by Mark Romanek (who unsurprisingly I had never heard of), is also a beauty. Like the book, it made me scared and weepy. Ishiguro writes a blend of Japanese and English styles, somehow both melancholy and impassive. This book had some failings, an odd arrangement of plot here, a convenient tying off of loose threads there - but its powerful composition made me let them go. And this is a rare adaptation that so closely follows the story while doing justice to the sentiment. Never Let Me Go has a tone of helpless silence that is most striking. No reader or viewer is new to dystopian fiction - from Hunger Games to 1984, there has been a lot in this genre. Doesn't the word dystopia conjure dreadful provocative images in your mind, the kind filled with torture chambers and riots? Never Let Me Go is not that. It is much closer to home. Do not watch the movie expecting a story about three friends teaming up against circumstance, to overthrow an awful authority, if only to end up squashed by the system. Ishiguro and Romanek have penned a far likelier version of the future for the vast majority of us. It is a world where you accept what is thrown your way, because that's what most of us would do. The quiet resignation in Kathy's voice makes the movie most haunting. And what makes the story most effective, irrespective of medium, is this - you never meet the bad-guy. The normal people, who are not duplicates and organ donors, are the teachers at Hailsham school. And they never outright mistreat the children, they do nothing that doesn't happen in schools now, nothing you want to shout at and protest against. You see the injustice in the little things, the rundown cottages the kids move to after school, the deliverymen who can't quite meet their eyes. The sad truth of the story is it makes you empathize with both sides of the coin - the main characters, who are little more than experiments created to serve others, and the rest of the world that reaps the benefits of invention, guiltless, so long as they don't know what goes on behind closed doors. The cast is great, just like I had pictured them. There should be a word for finding out the book adaptation you really want to watch stars Keira Knightley. In this movie, unlike her others, I actually liked her in the role of sassy, headstrong Ruth. The book gets its title from a fictional song that little Kathy dances to, imagining herself an impossible future. The scene in the movie, somewhat different, is still touching, and the young actress who plays Kathy conveys a multitude of emotions through her little swaying dance. She brings this light to the first half of the film that is just charming. Her bond with Tommy is precious. And she looks uncannily like Carey Mulligan, who plays grown-up Kathy. The movie appears inescapably English. Ishiguro uses rain as a frequent plot device, most key conversations happen because the characters are stuck somewhere while it's pouring outside. True to the narrative, the film has this drab rainy appearance that makes it even gloomier. The story is brimming with ideas and Ishiguro lets them brim over inside you, leaving a hundred questions unanswered. The movie could have been more dramatic, graphic, but it maintains Ishiguro's subtlety. Don't watch the movie with a closed mind and expect to be taken by the hand and led through an experience. Open your mind, welcome in the discreet flavourless terror and your imagination should suffice to drive you crazy. Homo homini lupus - man is wolf to man. Floating on waves of post-book happiness. Blown away. So dark, menacing, so urgent. Painful. Cerebral. Compulsively readable.... an outpouring of admiration, that was me for hours after I finished the book. I had to call my sister to effuse. This review is thanks to her. "The fate of people is made like this, two men in small rooms. Forget the coronations, the conclaves of cardinals, the pomp and processions. This is how the world changes: a counter pushed across a table, a pen stroke that alters the force of a phrase, a woman's sigh as she passes and leaves on the air a trail of orange flower or rosewater; her hand pulling close the bed curtain, the discreet sigh of flesh against flesh..."
Picture this. England of the 1520s. As secret wildfires of a new religion are lit through Europe, Englishmen are burned for heresy. Queen Katherine has failed to bear Henry VIII a son. England is on the brink of a civil war. Enter Anne Boleyn, a sly serpent, a shrewd temptress. Henry, desperate in love, seeks to break free of the heirless marriage, to annul it. Scandal ensues; the Roman Church and most of Europe stand staunch against King Henry and his wish to marry Anne, to renounce the law and be his own master. Into this impasse steps Thomas Cromwell. He is vastly different from the nobility of the Tudor court, a man with the face of a killer, the only one who can realize the impossible. Because Mantel's Cromwell is a person, not a symbol. A loyal servant and a kind father, he is religious in his own way, not orthodox nor explicitly a Protestant. Above all, he is a man who has examined himself and has reconciled with what sin he has found within. Some of my favourite scenes star Cromwell and his wife, their quiet intimacy is very real. The strangest moments are when Cromwell feels surprised by the way he is perceived by others, and is then surprised by his own surprise. He frequently doubts his own beliefs. In his musings on religion and his thirst for knowledge you see an intellectual. His endless displays of cynicism, quick wit and bold plotting reveal the calculating genius that coaxed the Parliament into breaking away the Church of England. The characters in Mantel's England are all retold from this quasi-villain's perspective. Cardinal Wolsey plays a huge part in building Thomas Cromwell and has hence the most crucial role in this redefining of history. 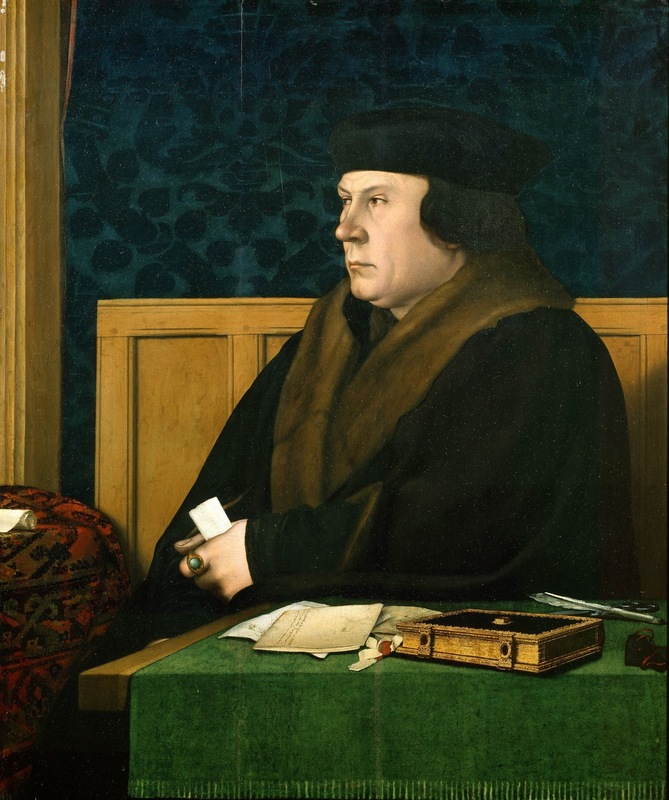 Saint Thomas More, the philosopher and martyr, appears dangerously self-serving. Henry to him is intelligent but a lost lamb. Anne Boleyn, full of surprises, not to be trusted. Mary Boleyn, pretty and feisty, earns his sympathies. Katherine of Aragon he finds proud to the point of foolish. Princess Mary, frightfully but perhaps deceptively weak... the list is long and I'm afraid I am running out of adjectives. The sheer scope of the book inspires wonder. Six hundred pages and never a dull moment. Mantel has garbed the story in intricate detail, converting research seamlessly into plot. No clunky dumps of information. It takes great narrative skill to flesh out the story like that. Stylistically, the book is odd. It has colons and hyphens where none are necessary and a noticeable dearth of quotation marks. For the most part of the book, Mantel refers to Cromwell not by name but as "he." Cute. Except, with a cast of some fifty characters and at least five Thomases, her copious use of the indefinite pronoun does get a little trying. Truly hen-peck-ish of me, I know, to call that a flaw. The story is narrated entirely in the present tense and it feels as if you have been placed right in the middle of the action. Prior knowledge of the Henrican reformation is not mandatory to read and enjoy the book - I had only vague recollections from an old obsession with the Tudor dynasty. That being said, an interest in politics, theology and history would certainly make the book more lastingly effective. If you know your history, by the way, you would know that Cromwell had anything but a happy ending. But in Wolf Hall, Mantel has given him just that. The book ends when he is at the peak of his career. So the one thing keeping me from diving for the sequel is the undeniable fact that there is trouble to come. 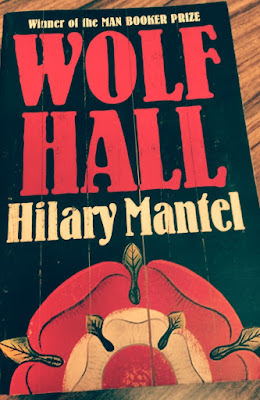 I shall grant me and Cromwell a month more of happiness before taking on Book #2 - Bring Up the Bodies by Hilary Mantel. "The world is not run from where he (Henry) thinks. Not from border fortresses, not even from Whitehall. The world is run from Antwerp, from Florence, from places he has never imagined; from Lisbon, from where the ships with sails of silk drift west and are burned up in the sun. Not from the castle walls, but from counting houses, not by the call of the bugle, but by the click of the abacus, not by the grate and click of the mechanism of the gun but by the scrape of the pen on the page of the promissory note that pays for the gun and the gunsmith and the powder and shot." A must read, if ever there was one.